Arrive at Villa and you will find it set in a beautifully laid out garden with tropical foliage and a swimming pool with crystal clear blue waters. This luxurious villa for rent close to Calangute beach is sure to make your vacation a truly memorable one. Our taste fully furnished 4 bedrooms, 4 bathroom villa is highly recommended for guests who appreciate quality and comfort. This prestigious location is ideal for those who love the sun and surf and never want to miss out on the exciting Goa nightlife. 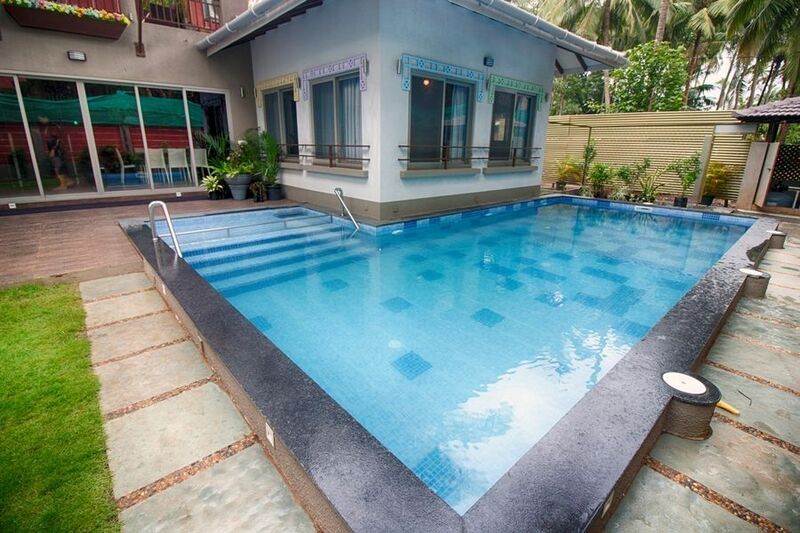 This villa for rent is just 800 meters away from the warm sea and close to both Calangute, Candolim and Baga beaches with various shacks serving local food and the wild nightclubs has always been a tourist magnet. Theres nothing better than staying close this most happening area if you are in Goa. This villa with its private pool promises you all that you are looking for in your vacation home. The living room like the rest of the house is done up in a lot of fun colors to keep you pepped throughout your vacation. After all whats Goa without some extra fun? The high ceiling with paneling in this room adds to the uniqueness of this beautiful villa in Calangute. This opens to a large sun deck which overlooks your private pool. You may sit out and enjoy the pleasant goan weather. Adjacent to the living room is an eight seater dining table overlooking the garden which will have you making long post meals conversations. There is a well equipped kitchen on the same level with all modern appliances like fridge, microwave, hob, chimney and all necessary cookware. Should you need the services of a chef, the same can be arranged at additional cost. All 4 bedrooms in this luxury villa for rent have attached bathrooms and are tastefully decorated to appeal to anyone with great taste. Walk out and you have your own private pool waiting for you. Enjoy your time with family and friends and spend hours by the pool. The caretaker of the villa stays close by and will be happy to help. Daily housekeeping facilities are included in your stay. The villa has its own inverter for power back up. Our stay was pleasant. Just a food for thought that the gas burner is risky n complicate to handle. Our stay was pleasant. Just a food for thought that the gas burner is risky n complicate to handle. We enjoyed every nook and corner of your villa. Thank you so much for all the facilities and comfort offered. Have a great day. Looking forward to book again with you. Cheers!